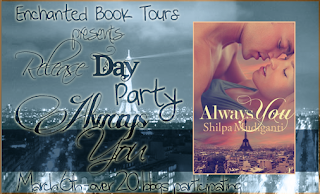 Welcome to the Release Day Party for Always You written by Shilpa Mudiganti. Read on for more information and don't forget to enter the giveaway at the bottom of the page to win one of five e-book copies of the book! What Lyla did not know was all that Alex wanted in those five years was her. Because the Casanova had fallen in love. Five years back, when Alex met a grieving Lyla at his friend Andrew's grave, the world had blurred in the background. He fell deeply in love. Yet, Alex was harboring a secret that, if known, would destroy his relationship with Lyla and it did. But now, fate brought them together in such a way that they had no option but to remain dangerously close - dangerous enough for Lyla to fall in love with him again. How can she?, she argues. Not after what she knows about Alex? What he did to Andrew? Shilpa Mudiganti Mirza grew up making up stories in her head. Starting with innocent babbling, genre of her stories changed with lessons growing up teaches us all. She thought life would be all about her stories until she completed her technical degree. Security of an IT job lured her leaving her stories to continue brew up in her head. Yet soon she had to fall in step with what fate had planned for her and she penned her first romance novella, Always You to be published by Inkspell Publishing. There has been no looking back since then. Juggling her day job as an IT geek, she has penned down her pet project, an exciting fantasy story of lions and wolves which, to her utter delight, is going to see the light of the day early next year. She says you would fall in love with her wonderful hero and heroine. Thank you Nicki for hosting me today. I appreciate your tremendous support! :) I am so excitied. Wee!! I want to read Always because it sounds like a fantastic read!